This basqued bodice falls over a perfect cascade of drapery at the back of the skirt to create the fashionable bustled silhouette. The concept of the bustle was not new as devices had been used to thrust out the skirts for several hundred years. 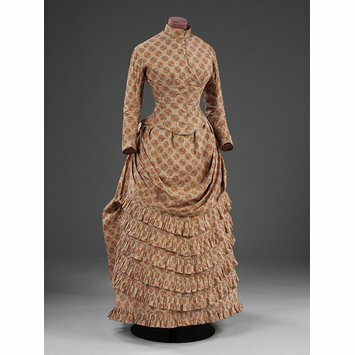 During the mid-1880s, however, they did reach new and exaggerated proportions, jutting out almost at right angles from the back of the skirt. They came in a huge variety of styles, from crinolettes made of steel half-hoops to down-filled pads and wire-mesh structures which folded in on themselves when the wearer sat down. The use of drapery made dresses look complicated, but they were usually composed of separate pieces arranged onto a foundation skirt. On this dress the pleated ruffles are machine-sewn onto the front panel of the skirt to give the impression of a multi-layered garment. 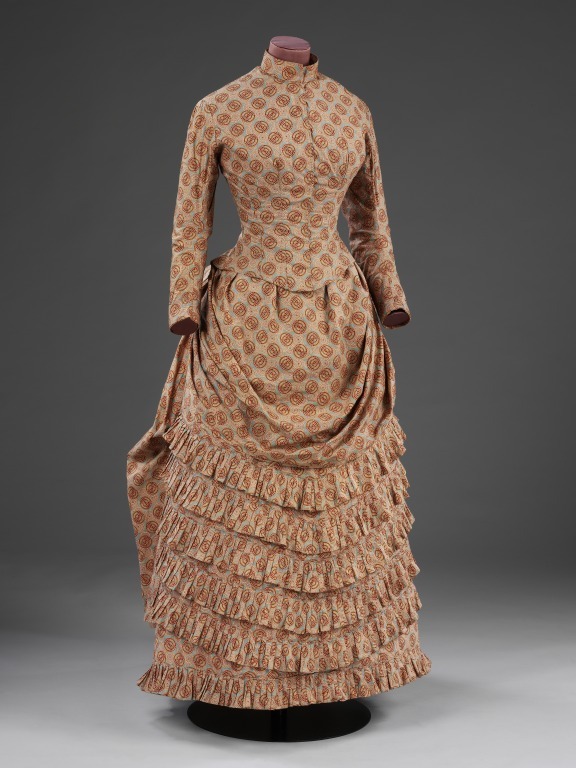 The swathe of fabric at the top of the skirt was known as scarf drapery and it created a simulated overskirt when pulled up and pleated into the side seams. Day dress (bodice and skirt) made of printed cotton stitched onto a cotton foundation skirt. Jacket bodice and skirt, made in Great Britain, 1885.